SUPERWANI: How to squeeze 30 days of joyous to 1 day. How to squeeze 30 days of joyous to 1 day. Miss me?I have been in hiatus. Actually, during my hiatus, I have been so much closer to you (assuming my followers semua tinggal di Malaysia). Yep, I was home for a about a week. I tell you it was a bliss being able to puasa in Malaysia. MasyaAllah, best sangat2. Especially for hubby who had his last Ramadhan in Malaysia like 11 years ago. I could not help giggling seeing him so excited for bazaar Ramadhan, roti john, murtabak, and all. Too bad we spent the final week of Ramadhan whereby the stalls had slowly reduced in number. So, one week definitely isn't enough. Put food aside, he was also excited to finally be able to perform terawikh and qiam at masjid after all these years in Japan. Alhamdulillah..
Raya pertama is quite hectic I tell you. 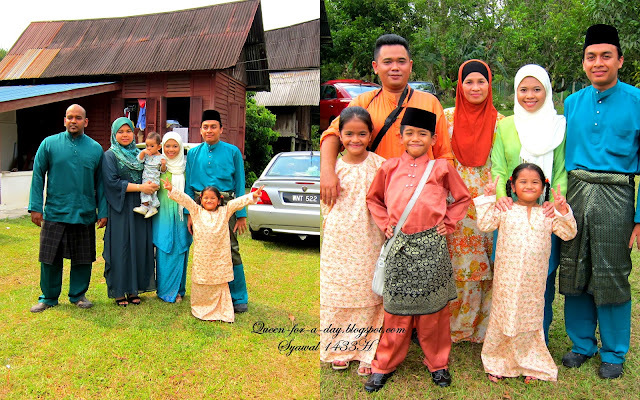 This year, we spent 1 Syawal morning in Ampang, my in laws' house. First thing first is solat sunat Aidil fitri. I was sooooo shocked looking at ramainya orang mashaAllah..
Orang melayu tak ramai pun tapi. Indonesia..ramai gila >,< haha. 2. You can`t squeeze all kubur to be visited in one morning. So, I decided to visit and do tahlil ringkas at my late dad`s kubur a day before 1 Syawal. Syawal morning, we just visited kuburs around nearby. 4. Ask for kerjasama dari ahli keluarga yang lain to understand or better follow your schedule. Alhamdulillah, both sides are very understanding towards us. I can`t thank especially my mom enough. I had a very limited time with her this time around. I promised her a better plan next time. Better yet be home for good. So, with the help of my other siblings, we plan the time to meet at our kampung since my nenek insisted to see me and my husband after a long time. We just had to rush to Seri Menanti. All my life, road to Seri Menanti was never that bad. If jam pun sikit di Bukit Putus where people then to slow down. But bukit putus now got bypass, I assume the problem has been taken care of although it wasn`t that serious like we experienced in KL. But that day, we stuck at the bypass for a good 1 hour! !fuhh!rintangan betul. The funny thing was, all of my siblings stuck together.haha..
5. Marry someone who accept you for who you are and tolerable. Important so he understood your decision also could tolerate to that. Don`t forget, we have to be accepting and tolerable to him as well. Eh, what is your theme for raya? OMG! !knowing me yang suke sangat buat syarat-syarat kehidupan ni, of course I'll have theme too. 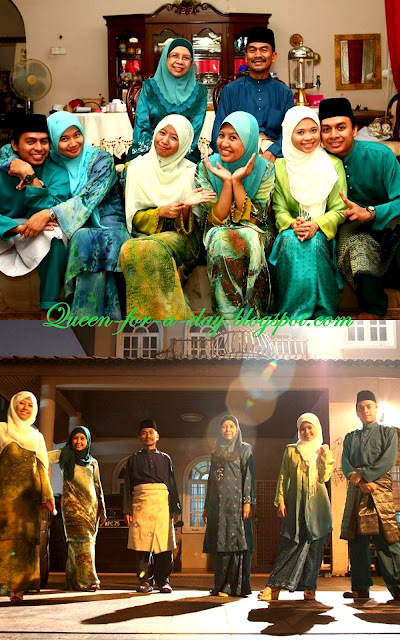 I was shocked the morning raya..adeh..banyak betol turqoise :D haha. In laws;) OMG..I don`t know other in laws yang sporting ghope ini. haha. Alhamdulillah..
Then in the afternoon, we bertolak ke Seri Menanti. 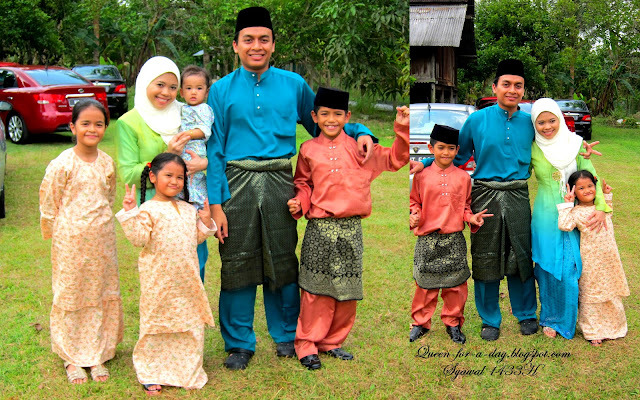 To my nenek's house coz my mom and siblings were there. With my family, berlatarkan rumah nenek. Then we moved back to Ampang for meet and greet other extended relatives. We try so hard to see as many people as we can in one day. But, who am I kidding? If we want quantity, we wouldn't get quality. So, most of them, we could just salam, bermaafan and asking around the most 3 questions. Then, next! Sebab berlari-larian ni also, I couldn`t stay at any sides to help around. 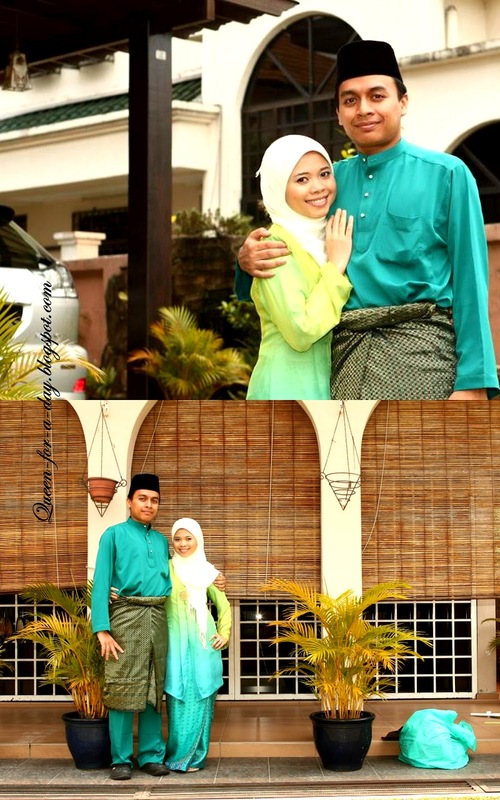 So, basically, I am still not familiar with my husband`s family raya dishes >,< Semoga masih ada raya for me next year. InshaAllah.. I hope my homesick will end when Syawal ended (when nobody in twitter sebok-sebok rebut tarikh open house derang:/). Apologize for keadaan caca marba of my writing. I was sooo tired at the moment. hehe..
xpe la. janji balik yuh.